The Tree of Life and the Tarot are closely related: Tree of Life is the symbolic system which underpins the Tarot. The Paths of the Tree of Life correspond one-to-one with the images of the cards of the Tarot and higher with the twenty-two letters of the Hebrew alphabet. In the Deck of Crowley and Haindl, among others, each one of the letters larger bears the corresponding letter. On the other hand, while the Paths act as the connection paths, the Sephirot or areas of the Tree of Life, fulfill the role of stations, points of arrival and departure. Sefira, in the singular and Sephirot, plural, are the words which technically are used to refer to each of these areas of the Tree of Life. As well as said that the Paths are an expression of the Major Arcana Cards and the letters, in the Sephirot are located the Minor Arcana Cards and the numbers. This system of Paths and Sephirot assumes in its functioning, complementing each other: each Path can clarify its meaning according to the Sephirot that connects. The interrelations of Trails and Sephirot, applied to the different situations of the life of a person, are valuable tools to provide guidance. Then I will explore the theme of personal integrity, as one of the conditions for human coexistence, from the interpretation of three Paths of the Tree of Life: Placed between Hod, Yesod, and Netzach and converge in Tiphereth. • The Path twenty-six (26), Hod to Tiphereth, that corresponds to the Tarot, to the Devil. • The Path (25), Yesod to Tiphereth, Temperance. • The Path (24), Netzach to Tiferet, Death. Who walk by these three Paths and travel in direction to Tiferet, is favoring the awakening of their most authentic possibilities, and the exercise of their freedom. Awaken the personal integrity is a search that is manifested with more intensity from the twenty-five years of age and continues throughout life. It is presented in the form of a balance sheet about what we think and feel about us and on the reality in which we move. And especially, what were our ways to respond and act. From the Tree of Life, this question is related to the three Paths mentioned above. According to this point of view, the ascending route of these three Paths can be the guide to discover some answers. Consider the triangular support formed by Yesod, Hod, and Netzaj (we of course to Malkut). On that basis we include everything that makes possible the birth of a being, its ability to stay alive, reproduce, develop mental and emotional strategies and connect and exchange experiences with their peers. This structure is at all levels of life - in different degrees of complexity - and of course in ourselves. To Netzaj, correspond to the movements that they operate independently of the will, such as metabolism, respiration, the movement and the glandular regulations, among others; the sensitivity and sexuality. In Hod, develops the ability to plan actions with a view to an end, the ability to develop the language and writing, to communicate and to establish relations of exchange, to think. Yesod constitutes a first shape of identity, build from the registration of the images of the external world, of dreams and fantasies and body image. The circuit that connects these three Sephirot, gives rise to the organization own the plane mammal that form a constituent part of the rights. We call it: organization alive-astute-ambitious. We could ask ourselves: what else? Is it not enough to plan mentally, dream - fantasize and metabolise? Yes, it is enough, at a level of evolution, which is the structure that we have just called " organization alive-astute-ambitious". It is unbeatable in regard to survival. But when it is already not only to survive but with-live, their answers are unsatisfactory. To explore this passage from “survive” to “live together” is essential to pass through all three Paths of integrity: The Death, The Temperance and The Devil. Only as individualities undamaged we can survive, i.e., to extend the framework of our relations, and to incorporate our life interpersonal, community and planetary: justly, it is a question of working the "together" of the " live together". In these three Paths are problematized the "human" part of the human beings. The "organization alive-astute-ambitious" exercises exclusive control of our responses, forgetting that its value is to be a support structure and not a point of arrival. In contrast, this point of view is to propose to Yesod, Hod and Netzaj, as the foundation essential to explore the three paths that facilitate awakening to Tiferet., as the goal of the tour. The results more paten-tes of this neglect, are for example, actions whose single mobile is the maximum economic yield in the shortest possible time, disconnected from the care and protection of the environment in which it is carried out. Are guided solely by the logic of exclusion and the maximum "Knowledge is power", but especially, "power of destruction". The word "Devil", comes from the Greek verb diaballo that means: "separate, sow discord, slandering". Refers to the division and confrontation. It also connects with the verb ballo: "shed", the same that appears in the word "symbol", only that in this last-associated to the particle "syn"- means "throwing jointly" and in "dia- ballo" means "shed by splitting or separately". This etymology is very revealing, because it connects with the two possible directions in the route of this Path: the that rescues the "dia" of "dia-ballo" - which in our view corresponds to the descending branch - and which retrieves the "syn" of "syn-ballo", own of the upward direction. "top down" and "bottom up" do not necessarily have the contents of "bad" and "good" or "inferior" and "superior". There are two options that lead to different results: in the first case, accentuate the fragmentation of knowledge and in the second, the unification or synthesis. In addition, this Path corresponds to the Hebrew letter Ayin, that means "eye, source". The eye on this meaning, not refers to our two eyes as the physical organs of the vision, but to a third eye as a tool of synthesis. This third eye involves the activity of the other two, but goes a step further than these, in what it does to find the confluences. What we suggested this Path is that progressively let abandoning the exclusion, as the only way of understanding and action to give step to integration. The same layout of this letter repeats this ternary schema: the main character occupies a third place, at the mid-point of a polarity expressed in figures of the bottom of the letter. The Path twenty-six, in its ascending journey, proposes to us to learn to synthesize the opposite in the level of knowledge. The word "temperance" is connected with the latin temperare, which means "mix or combine properly". How we combine properly what is diverse, and to what extent we do it, it is a topic of this Path. The temple in the music, for example, makes reference to both the harmonious agreement of several instruments or voices, as to the excellence of sound that emits a single one of them. However, in the Trail 25, the instruments of which it is about are ourselves, combining the harmonies that can better express our own sounds. To emphasize that it is only through the activity of the synthesis we reach Tiferet, the figure of this Card is in a continuous movement of exchanges and balances, through the game of opposites. This can be seen in the complexion of two shades: pale and dark; in a face with feminine and masculine traits; in the dark hair adorned with the illuminated ring; in the beam of fire and the cup of water, which holds in his hands the character. And at the foot of the Card, the golden cauldron, the container in which it is processed the new alchemical composition. This Path corresponds to the letter Samekh, which means "support". Is the indication that our sole breadwinner to evolve is to stay open to the synthesis. We have to distinguish "support" of "security". We live surrounded by "safe"; however, the more "secured" externally we find ourselves, less "sustained" internally we are. "How do I came in response to this time? what do I want to change?" "What are my safe places?" "How do I find my own direction?" "What is it that makes sense to me?" As we wrote the Path of Art or the Temperance connects Yesod with Tiferet, is the Path that goes from the Moon - regent of Yesod - to The Sun - the star that corresponds to Tiferet. Yesod symbolizes the place where we are safe and protected, but also crystallized and stopped. Yesod, in its most constrained sense, propose to us a childhood eternal; in contrast, in its wide sense, works as our ally, as the base from which to launch us to the future. The Art or The Temperance is crossed by the path twenty-seven, the tower; the crossing of these Cards means that there is only Art or Temperance. The Path twenty-five, propose to us the synthesis at the action level, rectifying our behavior based on attachments and constraints. 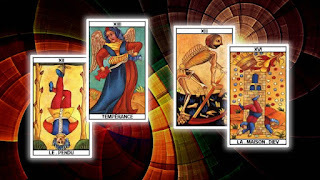 As we already said, each one of the largest in the Major Arcana Cards corresponds to a letter of the Hebrew alphabet. The consonant Nun, which accompanies this Card, means "fish, seed". The fish refers not only to the remote origins of life, but also to their fertility. The seed is life in latent form, promise of a new being. The Water of the Charter XIII symbolizes, from a psychological approach, the unconscious, the level most archaic of psyche. One of the possible connections between the symbols of the fish, the germ and the water - can indicate that the acceptance of and contact with the products of the unconscious is regenerating and renewing. There is a great fertility in that world, in appearance so dark, as well as there is life even in the dark depths of the oceans. The immediate effect is purification; it mobilizes the fear, guilt and envy. Instead of fighting internally to ignore these emotions, we have to accept; this is self-recognize that somebody is bringing to us a message. In this Path does not work to be "against"; it is the path of the active acceptance, which wants to investigate until the bottom, not of the resigned acceptance. Possibly showing some of our limitations. In the figure of the Card, the skeleton and the scythe, announce new forms of life. The skeleton in motion, highlights the transformation and change, not the stagnation. Dancing and to blow of scythe creates new forms and renews what is spent. Transform is to give rise to a different way to the already known, is to make a movement of what has already been frequented to the novel. The transformation is in the emotional plane equivalent to the synthesis, on the mental plane; observe in The Tree of Life the correlation of the two Paths, the 26 and the 24. The Path 24 proposes to us the transformation, at the level of the emotion. When the three Paths work commanded by the magnetic power of Yesod, the situation is the ego rigidly polarized - The Devil- actuating confusingly from fear - Art or Temperance - connect emotionally from the hatred, resentment, revenge and envy - The Death-. However, these same trails conducted from Tiferet, activate our mental capacity for synthesis - The Devil - we boost to accept the challenges that allow us to evolve - Art or Temperance - and we purify emotionally - The Death-.